Craig's Photographic Journeys and Ramblings: Hot Wheels! I had an idea for a fun little project and its been cool to have it evolve from the concept in my mind to an actual image. One of the upcoming competitions for the Foothills Camera Club is Digital Creative where not only is digital manipulation allowed its encouraged. My thought is, why not do the wild and crazy stuff in camera? Okay, so this idea I had wasn't that wild and crazy but for the folks at the FCC its certainly off the beaten path. 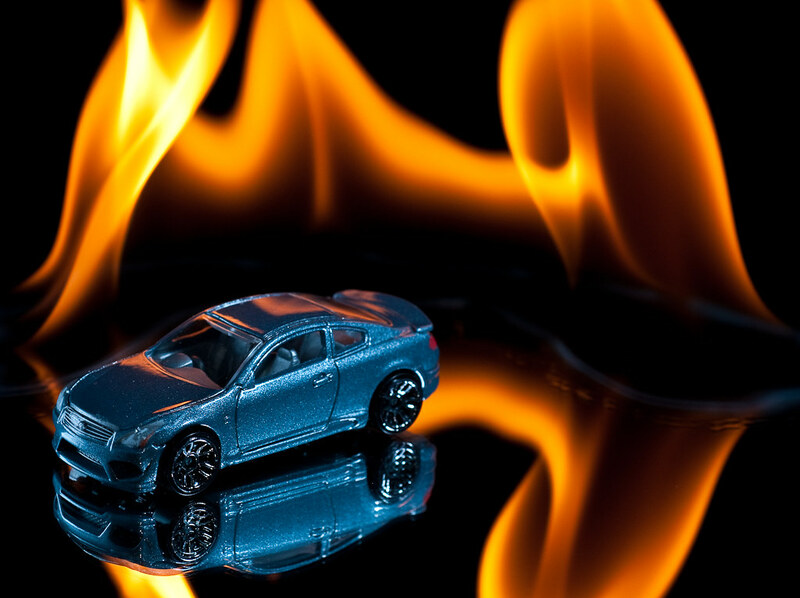 I had in mind taking a picture of a Hot Wheels car on a mirror with two parallel lines of flames extending from the tires. I wanted more of an orange flame so I had to come up with something that was flammable that would burn the color I wanted. I thought of using hand sanitizer but since it has a high alcohol content it would burn blue. (The gel itself, it turns out is quite conspicuous in the shot too.) Along my travels this weekend I came across a cleanser called "Goof Off" which is basically a alcohol and petroleum based solvent. Sunday my wife and I went to the mall and I made a stop at Toys R' Us for my car - a 2010 Infiniti G37. (Sweet ride for a toy car!). The mirror I had wasn't going to work so I bought a cheap door mirror from Wal-mart for about 7 bucks. I removed the frame from it that it wouldn't show up in the image. (The thing was practically falling apart so that part was easy). The next part I had to think about a bit more. How the heck would I light it? I initially thought of just bouncing flash off my umbrella but I knew it would scatter all over and hit my background. I also wanted a fairly edgy looking light. I settled on going with a bare flash zoomed out and snooted to get the beam nice and tight on the car. I decided I wanted a blue look to the lighting on the car so I put a blue gel on it. With everything setup (and my fire extinguisher handy) I did some test shots of just the car to get my lighting down. I noticed that the front side of my car was a little dark so I just used a small reflector to throw some fill light on that side. The results were pretty good. I was shooting at f/9 and everything looked like it was in focus when I did a depth of field preview. It turns out it wasn't...f/11 might have worked better but my flash was having troubles keeping up anyways which sucked. I did try the hand sanitizer and while it burned slowly the flame was blue as I expected and as mentioned above, you could actually see the gel in the shot which wasn't going to do. After a couple of tries to get even a single line of fire behind the car I realized that my original idea wasn't going to work so I decided to make an arc of fluid on the mirror behind the car and I was a bit more liberal with the application. Bingo! Lots of good flames and I had a chance to shoot a couple of frames. You can check out the setup here. Posted by Unknown at 12:21 a.m.